MotoOnline lists some surprise factors of season 2014 so far. As we enter the six-week mid-season break in the 2014 Monster Energy MX Nationals, MotoOnline.com.au singles out 10 aspects of the championship that haven’t followed the script. 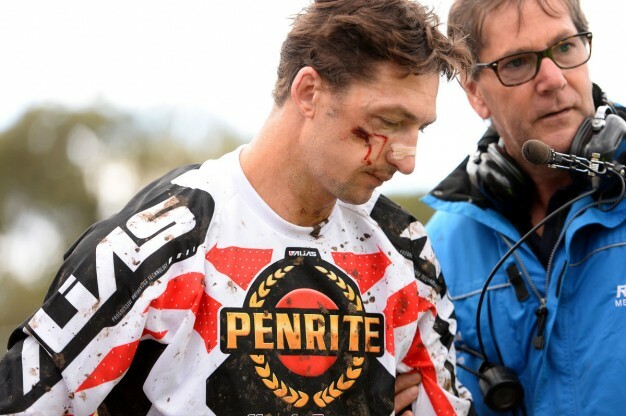 Riding high on confidence from a dominant display in the New Zealand Motocross Championship, Cody Cooper’s MX Nationals campaign effectively ended three laps into qualifying at the Broadford opener when he collided with a security fence and busted his face up. The damage was bad enough to warrant corrective facial surgery and end Coops’ championship bid before it even began. He returned two rounds later at Wonthaggi, but crashed again at Murray Bridge and injured his knee. While the extent of his latest injury isn’t known, it’s expected he’ll be out for the season. You wouldn’t read about it. In a stunning turnaround from last year’s hot-and-cold debut MX1 campaign, KTM Racing Team’s Kirk Gibbs has been the most consistent rider in the MX Nationals paddock by far. He stood on every podium at the first four rounds, with the only ‘blemish’ occurring on the weekend at Wanneroo where he placed fourth. If he keeps up that form in the second half of the season, he’ll be a heavy title contender. The resurgence of privateers riding two-strokes in the MX2 class has thrown the whole field on its head. Whereas only a handful of blokes turned up on the dingers last year, 2014 has almost seen a return to the good old days where premix ruled. It shows in the overall results too: six of the top 10 are two-stroke privateer riders. On top of that four of the five rounds have been won by two-stroke racers, including a podium clean-sweep at Murray Bridge (Luke Arbon, Brenden Harrison and Kayne Lamont). Almost imperceptibly, New Zealand’s 2013 MXD champion Hamish Harwood has crept within serious striking distance of series front-runner Luke Clout. He’s kept his nose clean at every round and his consistent 3,3,3,7,6 results so far have seen him slide under the radar into a dangerous second position, just 10 points off Clout. The matter-of-fact Harwood is employing a similar tactic to what won him the 2013 crown, where he’s happy to chalk up consistent results if it means a title come September. Of the first five rounds, three were expected to be sand-based, but it didn’t quite work out like that. Wonthaggi wasn’t ripped deep enough to bring up the usual sandy loam and became a skatey circuit peppered with big holes. Murray Bridge offered up similar conditions – a lack of rain and track watering saw the track become a semi-hardpack circuit at best. The deep sand of Wanneroo didn’t disappoint, however. …hasn’t worked. 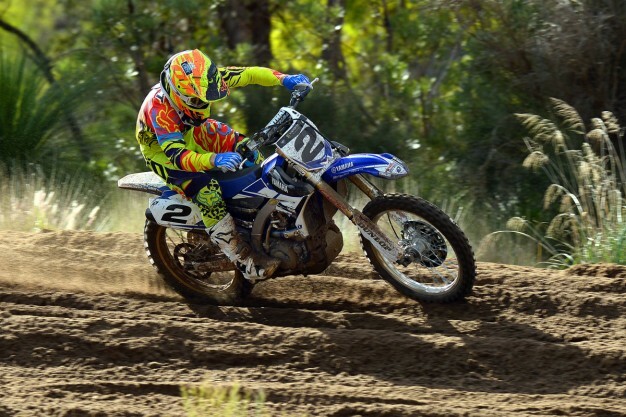 It was widely believed that former multi-time Australian Motocross Champion Jay Marmont’s return to the CDR Yamaha team that guided him to four consecutive titles would see him return to form and pace that had eluded him during his two years at Kawasaki. But surprisingly the power-pairing of Craig Dack and Marmont hasn’t culminated in improved results. The diesel engine of Australia MX still can’t find his way towards the podium and is currently sitting in 10th position. Many expected Tunetech Racing KTM’s Kale Makeham to be a heavy title threat this year, but for one reason or another, the likeable Victorian’s 2014 campaign hasn’t really got cracking. He snapped up a second place at Appin and missed the podium on countback at Wanneroo, but his sixth position in the MX2 championship is below many people’s expectations, most of all his own. Just when we’d all come to terms with the fact Ben Townley had officially retired from professional racing, the Kiwi legend made an 11th-hour announcement that he’d return for the Wanneroo round on the weekend for a guest appearance. WA fans were treated to an impressive ride by the former World motocross and AMA Supercross champion, as he finished the day in seventh position. Don’t expect this to be the beginning of a new era for BT101 though. He’s more than happy to turn up, race the odd event, then return to the sidelines to let his blisters heal. We’d all expected last year’s timing issues would be solved for 2014, but there are still gremlins in the system. Meanwhile the new live streaming of practice/qualifying and the final motos that WEM is trying to implement through My Sport Live is patchy and buggy if it has even been able to be broadcast. Plans are afoot to continue improving the service, so we’re crossing our fingers it delivers the goods in the second half of the year. Every year one young kid will stick his hand up and look to dominate the MXD class. But not in 2014. The groms have shown some epic racing with four different winners from four rounds, with only three points separating the top three and a scant eight points between first and fourth. Egan Mastin, Jed Beaton, Jack Simpson and Nathan Crawford have all decided they want their name etched on the 2014 trophy and are going to go hammer and tongs right until the Coolum finale.